A Darling Kind of Life: Little bit of this...and a little of that. Little bit of this...and a little of that. We've started behavioral training. Cale is actually doing waaaaay better than I guessed he was going to do. We have a rewards system set up and with each thing he completes he gets a point and with so many points he gets a reward. At this time it's very simple and going well. There was a fairly big explosion on Saturday because he didn't have enough points to go downstairs for Dunkin Donuts, but we moved past it and kept going. Today he wanted D&D so we counted points together and he needed one more. He looked through the list and then looked to me and said, "shave me." Ha! Getting him shaved meant a donut and a trip off the unit! So far his trips off the unit are with me and one of the staff. Even though it's just downstairs, Cale loves getting to leave 7E! We're hoping to build and tweak the program to fit our daily doings at home and maybe help take a lot of the fuss away. Along with getting to go downstairs we also get to sit outside in a little garden area and get fresh air...of course...we seem to get a bit crazy with fresh air! Cale wrote a letter to his brother. He actually wrote words!!!! Like more than just a couple and without much help. Some of it is still hard to read unless you focus on it, but actually I feel like he did really well with this one. Since he had enough points he also was able to walk it downstairs and drop it in the mail box! He loved it! 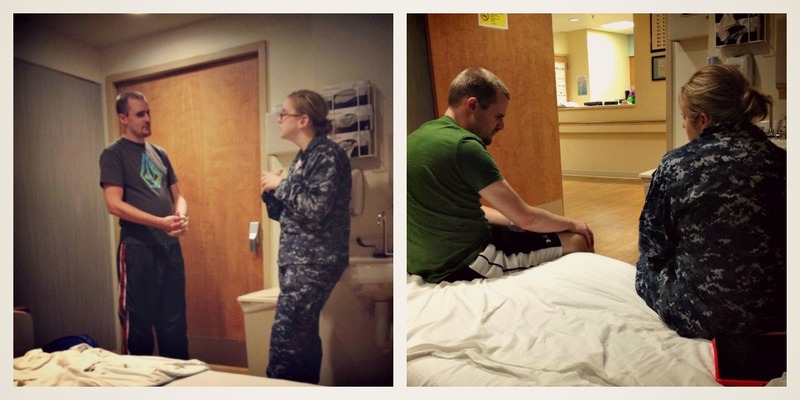 The nursing team spends a significant amount of time talking Cale through his anger. This is a huge part of each day around here...I have to hold back laughter sometimes because they're so very patient with him but they'll have this discussion with him and just when they think they're almost done, he starts over with the same question. I deal with this every day and watching from the outside it's a lot more fun! The talks are progress rather than big ol' explosions! We like to just chill. The hospital was quiet yesterday so we played games, cuddled, listened to music and watched a movie! Nice relaxing day! I love you guys so much!Kathleen ... you continue to inspire me with your constant blog posts even when you might not feel like sharing after having a busy day.And Cale ... you continue to inspire me with how well you are doing in your therapy, I know God is working in and through you to do His good will.Keep up the good work friends! Thank you for this post! Gives us a glimpse into what you are doing there on a daily basis! I loved the part about wanting to get donuts and him saying to shave him! How great! (I completely understand the desire for DONUTS!!! LOL!) :o) You are both AWESOME and God is sooooo good all the time! Sounds like hes doing great. I hope more and more porogress will be coming along. I hope it won't be stressful or frustrating anymore.